I made a HUGE mistake risking the chance of getting T-shirts through an online store. UGHHH BIG MISTAKE!! The T-shirts I had received are not sell able and was just a big disappointment! I will be visiting a local T-shirt printing company here in Kingston NY “Sunshine T’s” They created my Neurotic Nora T shirt design and the quality was outstanding. So the T’s are on the back burner at this moment in time. Will keep you updated on that very shortly. I have been bitten by the vintage bug and have been visited by Halloween’s past. A little ghost whispered in my ear and said I am here I have not disappeared do as I say in the end you will scream Hooray!!! So I have been screaming hooray as I have been using the look and technique of Halloween’s past to create some of my newest designs. 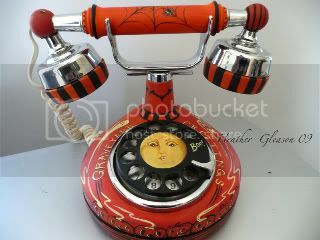 Mirrors, decorative wood stools, and this vintage western electric rotary phone. If you would like to purchase any of these pieces click the buy stuff button or contact me directly. Well I hope everyone has a wonderful day. I Will be back on a in a few days with some more updates.